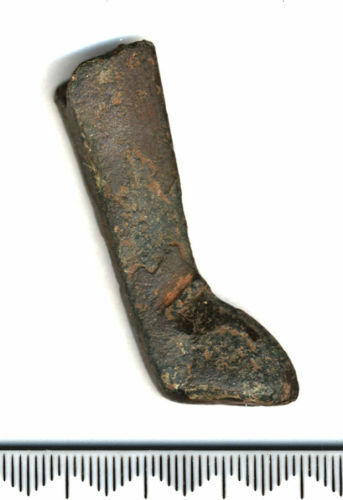 Cast copper-alloy vessel leg, pentagonal in section. It tapers from 10 mm wide and 13 mm thick at the top to 7 mm wide and 10 mm thick at the 'ankle', where it turns to form a foot. There is a ridge across the two front faces of the 'ankle'. There is a deep void in the broken top. Total surviving length, 45 mm. These legs can be from ewers (jugs for holding water) or from skillets (saucepans with three legs).